I think we must really love squirrels. Deep down, I am sure most of us, as a population, really truly must: Cartographers, local government officials, sign-makers, citizens, students, poets, farmers and scholars. 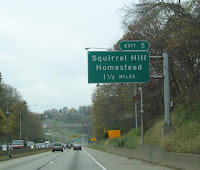 Why else would we name so many of our homes and venues after these animals? Why else would we want constant reminders that squirrels grace this planet of ours? Wherever we go....there they are! Squirrel Point Lighthouse in Maine, here in the U.S.
Squirrel Corners near Monticello, N.Y.
Squirrelwood Road in West Paterson, N.J. I could, of course, keep digging and find more. And - so could they. It says an awful lot about our species, when you consider the way we humans sometimes approach problem-solving: If all else fails, we make the problem go away by eating it. I used to think this was a uniquely American trait - seeing how many people in the U.S. could easily swap out their stomachs for trash-mashers with little discernible difference - but now I am not so sure our nation has exclusive rights to this kind of bad taste. Here in the States we are in the midst of horse-racing season, and the nation is still reeling from a tragedy on the racetrack immediately following the Kentucky Derby, when the lone filly to run (she finished second!!) sustained a fatal injury and was euthanized on site. 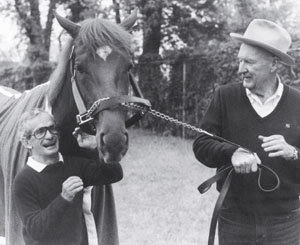 So I was horrified to learn of an even worse fate visited upon a first-place Derby winner back in 1986, a big brown horse named Ferdinand, who was ridden to victory by the legendary American jockey Willie Shoemaker. Ferdinand did not experience similar glory as a stud, and he was something of a failure in Japan too, where his American owners shipped him eventually, for a second try at procreation. Ferdinand posed a problem - he was now too old to race and he did not produce a new bloodline of future champions. So he was taken to the slaughterhouse in Japan and converted into something edible. And that is how a Derby winner, and the 1987 Horse of the Year, met his end. 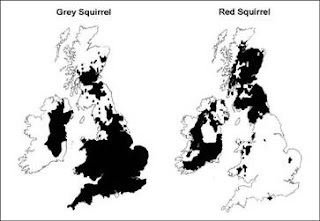 I think of Ferdinand now as I read of one solution to Britain's unfortunate influx of aggressive eastern grey squirrels - a non-native species that never asked for such immigration status. They are, for the most part, reviled, hunted and killed because they displace the beloved native reds - and the latest solution is to serve them up on the dinner plate, energizing the local economy, bringing a boon to butcher shops and posing a fun challenge to creative home cooks as well. I'll have none of that, thank you. It turns my stomach to think we humans, for all our cleverness, have chosen to think with our appetites instead of our minds. We are a sentient species and yet, for all of that, the best we can come up to solve various problems is to slaughter a champion horse (one of many to have met such a fate, I've been assured) and a challenge to creative cooks everywhere to fry up some squirrel. The worse tragedy here, I fear, is that people really believe this is the best we can do. I'd like to think we as a species can do better. At least I hope and pray we can. Was there ever a better sales job than this? Knocking on doors, making a big pitch to the homeowners responding, and clinching the deal every time. 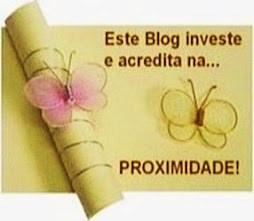 We're not talking about selling Avon or Amway or even those old old Encyclopedia Brittanicas (for those who remember them). 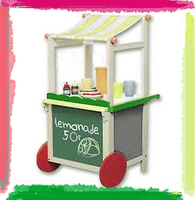 What is this ambitious little saleswoman selling? HERSELF and her need for some of the best nuts on the market. We're talking 100 percent success here - sitting on the doorknob until the humans inside realize you can run but you cannot hide, not from the very revealing full glass panel of a back door. There is no escaping the steely gaze of the determined saleswoman who also makes it known she is a single mom supporting a family (when she sits up, you can see she is also still a nursing mother). And notice, if you will, the members of her sales team very visible and present in the background. Would you buy a used car from this squirrel? 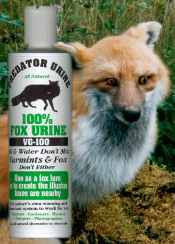 Today at work a colleague approached me asking, "Do you know where I can get some fox urine?" (Yes, I do get lots of questions like that from coworkers). I resisted the temptation to say, "Take the little guy to the neighborhood pub, buy him a few rounds of Heineken.....then hand him a paper cup and stand back!" Nor did I say, "Put on a white coat, and hang out a shingle that says 'Fox Urology Office, Our Fees Won't Leave You Pissed' "
And there was even one more smartypants phrase of mine that didn't leak out: "Go out, kidnap a fox and stuff him into a pair of diapers and make him drink a few liters of spring water." Of course I didn't say any of that. I knew this was really about squirrels. Squirrels in someone's attic. Squirrels in someone's garden. 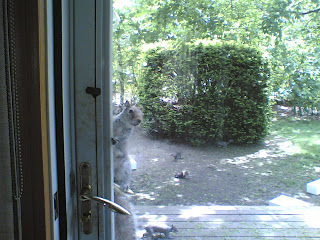 Squirrels someplace - anyplace - they weren't wanted. And because I have long been a proponent of convincing those who would seek to repel unwanted squirrels to do so gently, and using natural methods, when this subject of urine came up, I was happy to go with the flow. Foxes are natural predators of squirrels and so, if your nose can handle the less-than-golden scent that comes with this byproduct of the fox excretory system, you have what is truly one of the world's most golden liquid assets. A squirrel smelling this stuff will usually move on, having been outfoxed. We who love squirrels but don't want them getting into trouble - or getting hurt by people who'd rather not have them around (like my coworker) - are all for singing the praises of incontinent foxes. Fox urine, anyone? Oui, Oui! 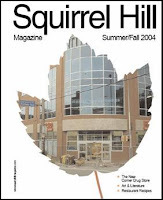 According to a recent story in the Sunbury, Pa., Daily Item, the Pennsylvania Department of State has received a filing from the Squirrel Reform Party to be a player, among the Republicans and Democrats, in this year's elections. Now everybody knows there's no George W. Bushytail in the running, and Theodore Rodentsevelt's term is long since past. Likewise, there's no candidate on the ballot named Filbert Jackson (nor a hopeful First Lady, Hazel Nutt, or a vice presidential Walnut Mondale on the ticket). And let's not even dredge up the sorry tenure, in the 1970s, of President Richard Milhous Nutkin. So what's up with Squirrel Reform, anyway? In a nation where states are officially considered "blue" (for Democratic) or "red" (for Republican), just where do the Greys fit in? 1. 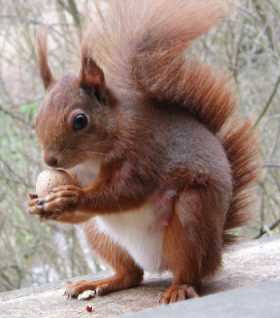 Campaign contribution overhaul: Donations of nuts shall be restricted only during the autumn months, and limited to a maximum of one bushel per voting household. 2. No political stumping whatsoever. In fact, no stumps at all. Trees are to remain intact in order to house the maximum number of squirrel families. 3. No vicious chattering about the opposition. Just think about it: If they succeed (which may not be such a bad outcome, if you think about it), our nation may end up in even more of a race for the Nut House. He's afraid of everything - strangers, the great outdoors, crossing streets, and especially germs. 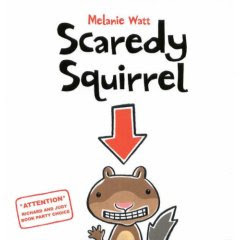 But there's one thing Scaredy Squirrel (from the book series of the same name) is not afraid of -- public speaking. Somehow, in the end, things always work out for Scaredy Squirrel: He realizes the world is not so horrible as it seems, and the threats that are out there, imperiling his very life and breath, are not nearly as formidable as he originally thought. These gentle, good-hum ored books are flying off the shelves (perhaps a tribute to Scaredy's status as a flying squirrel) and have been given honors from the publishing world. Scaredy Squirrel clearly has no fear of success. Quite the contrary: He's enjoying it (as is his human creator) - and he deserves it. 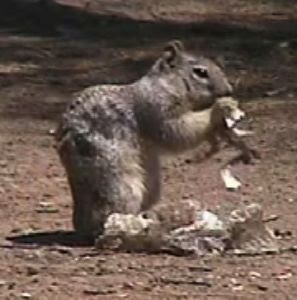 Researchers have done a fine job in discerning the clever and resourceful survival tactics of certain ground squirrels out West: These small creatures fool their predators by adopting the predators' own scent (in this case, the predators are snakes) by chewing on their discarded skins and then licking their own fur. They thus saturate themselves with Eau de Slithering Viper, or some other life-sustaining cologne. And snake smell is, to them, the very breath of life. Corporate America, I guess, is no different. The company where I work (no stranger to snakes of its own, by the way) has been sold twice in six months - not a very happy prospect for a person such as myself, concerned about job security and the future. 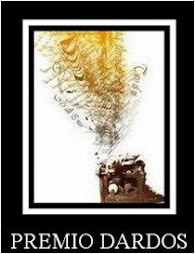 But I am not the only one, it seems, feeling preyed upon. Our most senior executives apparently have been taking their cues from the invaders. Not long after we were acquired by an eccentric tycoon with a penchant for dressing in worn bluejeans, our ultra-conservative top executive started trading his Brooks Brothers finery for open, tie-less shirts and a lot more of the "slouchy" look. All in all, I would rather work for a company owned by squirrels than by snakes. At the very least, you know that benevolent rodent ownership will permit, if not encourage you to store more than a few nuts in your pension plans for the lean years ahead. And thus, save your own skin against the toughest predator of all - the economy. A tree expresses its "inner squirrel"
Squirrels and chainsaws are not usually a happy pairing. Oftentimes someone takes a chainsaw to a tree, and a squirrel is left homeless or worse - a nesting family is dislodged, a mother squirrel displaced or injured and likewise, the babies injured or killed. Red squirrels carved out of redwood? It seems a natural pairing. Squirrels are arboreal, after all. Now here in the States, maybe someone can follow Thomas' example and carve pine squirrels out of trees from the pine forest and black squirrels perhaps from the wood of the black maple. Ah, but the real challenge is this: What do you create a chipmunk from? WOOD CHIPS?? There is a beautiful story told in Indian mythology about brave and industrious little squirrels who mustered courage and strength to help build a bridge across the sea to save a king's beloved wife, who had been kidnapped by a monster. Though monkeys loyal to the king immediately set to work carrying formidable rocks, the tiny squirrels could only carry pebbles, and for this they were disdained and cast aside - with one squirrel hurled, nearly to his death by one angry monkey working among the bridge-builders. 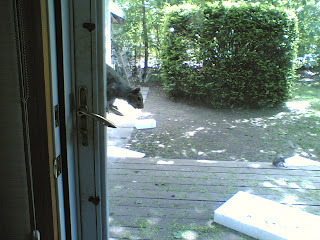 The squirrel's life was more than spared, however. Rama caught the little squirrel before any harm could come to him. And then he - and all squirrels since that time - were given a blessing by Rama, signified by the three stripes across the back - the gentle fingers of Rama's hand leaving their indelible marks. I first learned of this story from my friend Arul, who was born in India and is there now on a fellowship, reacquainting himself with these sacred squirrels. They visit his apartment terrace, much to his delight (and theirs!) 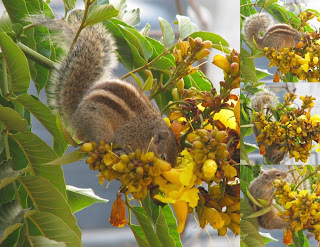 And I was reminded again of this story by fellow blogger Vineeth Sukumaran, who sent me links on the Flickr website to the beautiful photos you see here, the descendants of the blessed palm squirrels. How fortunate that there is a place in this world that reveres these beautiful, intelligent animals - and protects them from harm. 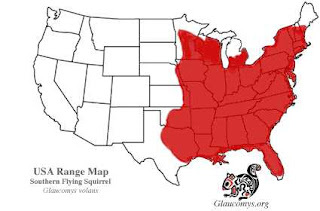 I wish the western part of the United States could feel the same way about the squirrels' cousins, the prairie dogs, who are being poisoned and gassed daily. And I wish the United Kingdom could also rethink the way it is dealing with an admittedly problematic overpopulation of introduced greys. I think we need more myths, and more realities born of such fine myths, to build a bridge of understanding between humans and animals often perceived as "pests" or "vermin." Perhaps can we can take our cue and our inspiration from the Indian striped squirrels, and help build that bridge ourselves, one strong pebble at a time. Even in his tough guy "Terminator" role, Arnold Schwarzenegger might not know how to resist the nut-begging antics of this one Amherst, Mass. 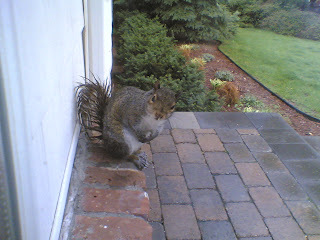 squirrel: Rocky the Robotic Squirrel is part of a behavioral experiment undertaken by scientists at Hampshire College. And he has a lot in common with Arnold because he is a mechanized life form (without the trademark angry scowl of AHHHHNOLD's "Terminator" role). Perhaps we should call him The Squirrinator. As he twitches his limbs and barks his prerecorded squirrel noises, his every movement is computer-controlled by researchers watching, through their binoculars, from not too far away. Rocky's mission is to interface with the real live locals, flick his tail, stamp his feet and crack the code (if not a few nuts as well) on how the local bushytails communicate. You would think in a New England college environment, the curriculum on this campus might simply opt to offer Squirrelese in their Department of Foreign Languages, instead of having to resort to such extremes. I guess, however, Rocky was born (or constructed) to learn the lingo through "language immersion." The question remains: Once Rocky has gotten an "A" for his efforts and compiled the lexicon, what next? Perhaps Hampshire can offer adjunct professorships for some of the more eloquent squirrels living on campus - with Rocky, because of all his efforts, presiding over them as chairrodent of the department? So he's not the Squirrinator after all. Just another "Nutty Professor." I'm not saying that being a wildlife rehabber isn't rewarding - it is. And I'm not saying that being a rehabber is easy - it isn't. But two tough decisions, and the directions of two lives, hang in the balance in the next week or so....and time is running out on both. I have a young female squirrel in my care - she has seven toes on her right rear leg, making her mobility somewhat hampered. 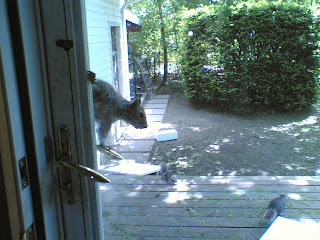 (Massa, the little squirrel, is one of the subjects of my April 22 post). But it is hard to tell whether she is also somewhat neurologic, another factor perhaps in her awkward way of moving. Two people whose opinions I highly respect (and who also work with animals) have suggested I have the two extra toes removed surgically by a vet. This is not uncommon but still, a source of concern for me. Still, I may have to make this decision soon. She is now about 9 weeks of age, and growing and.....developing from a somewhat user-friendly juvenile into a wild squirrel - as nature intended. That would make surgical aftercare problematic if I waited too long. She is on my mind and I will investigate this further - seeking the opinion next week of my vet. The other squirrel, also female, is a wild adult who frequents our property and is among the friendly ones who "stalks" me for the nut handouts that comprise a major part of our weekly household budget. Then I found, on closer examination when she came to feed, something that disturbed me even more: It is actually her upper incisor, growing through the front of her face! And yes, it is getting longer each day. What puzzles me is this: normally when there is this kind of overgrowth there are other issues. Infection, for one thing. Irritation, for another. And thirdly, an equally troublesome overgrowth of the opposing lower incisor which should be meeting the upper, and grinding against it, so both teeth stay short. If this squirrel is truly suffering from malocclusion (in that her teeth do not line up), it seems to me that she would have had worse jaw issues by now and would have starved. Instead, she can take nuts, presumably crack them, is fat and happy and seems none the worse for the wear. At least for now. My dilemma here is - do I trap her and take her to have the tooth trimmed? And then.....re-release her only to have this same issue come up again later? For both squirrels I wonder: When does intervention cross the line and become interference?There are no easy answers to this. Two lives depend on me making the right call.